Aha the day of LOVE is upon us! During this time of year, I can’t help but notice the explosion of chocolate hearts, love cards and red trinkets that surround me when I enter a store. I’m not going to lie, it does put me in a happy mood. But for me, Valentine’s Day is not about finding the perfect gift or planning the perfect outing, it’s about the extra effort you take to tell your loved one how special they are! Whether that means you get crafty, write a letter or spend the night in and watch your favourite movie, it’s all about the personal touches. Today, I thought I share a little love with you. 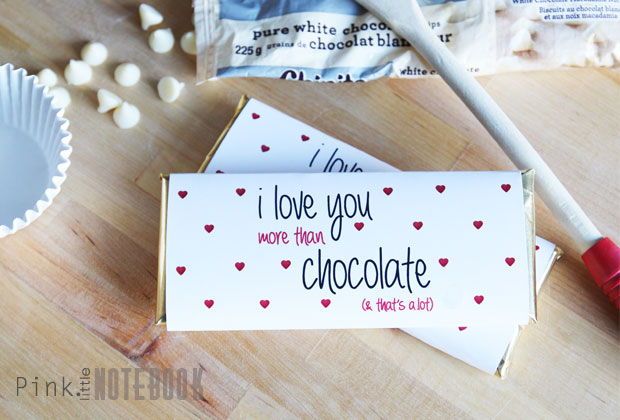 I’ve created this simple Valentine’s Day craft for all the those chocolate lovers out there. 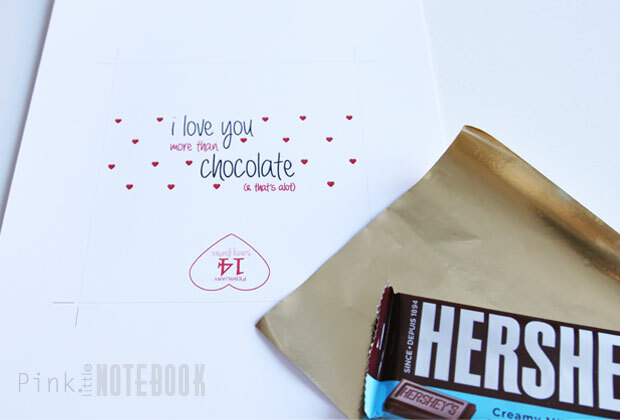 To begin with your V-day Chocolate Wrapper, download this free template and cut to size. 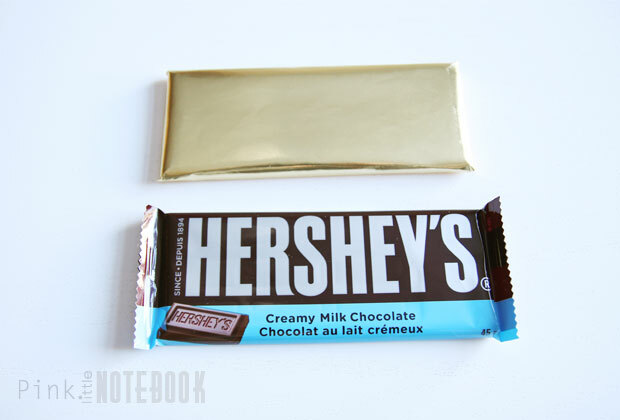 This template is great for any regular sized chocolate bar (45g or bigger). fold up top flap and glue in place. You should have a bar that looks like this. Next take the free template that you just cut out and wrap around the chocolate bar. Secure it with glue. And there you have it. 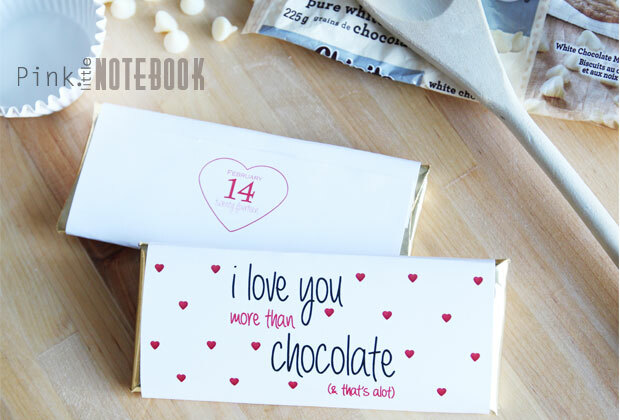 A simple and easy way to dress up your chocolate bars this Valentine’s Day! Haha – that IS a lot. There are very few people I would say that to 😉 What a cute idea! I loved it so much that I just pinned it on Pinterest! That is such a cute printable. You are so clever! Love it and it is adorable!!! My wife and i are not huge fans of this holiday.. but she always like to get chocolate. Too cute & super easy to make! Pinned! I LOVE creating these – I did this several years back to promote my business on small candy bars…they were a big hit. That’s a great idea too! Who doesn’t like to receive chocolate any day of the year?!? GREAT POST!! cute designs, and such a simple way to dress up your chocolate for Valentine’s day (not that chocolate *needs* any dressing up 😉 ! What a cute love note idea.! I am not sure yet, what I am doing for my hubby for Valentines day. Thank you for the free download. It is fun to make something simple cuter. Adds a nice persoanl touch. This is a fun little idea to do! I’ve seen something like this on Pinterest! I’ve never considered the foil before! Where did you get that? I wonder if there is pink or red foil available for an even more festive look? Last time I did wrapped chocolate bars I custom made ones for each kids for their classmates on valentines day. Well, the last time I did any that wasn’t just wrapping paper around chocolate bars for Christmas! Kisa, you can buy the foil online. There are tons of colours to choose from. You can definitely have some fun with these! What a simple and inexpensive way to show someone you love them! This year, DH and I don’t have a lot of money for Valentines’ so I may use this idea!! Thanks! This is a very cute idea. Great for kids to bring to school, or perhaps for the teacher?!? Definitely great for any chocolate lover out there! It’s posts like this that make me wish that we had a color printer. Nope, just a black laser. Oh well, I can enjoy your creativity though! I bet my kids would get a kick out of personalized candy bars. I had the same problem, I caved in and bought a colour printer this year! You can still print in black & white and use red marker to highlight the hearts! Great printable and I love the idea. Thank you! Great post and great idea. Now I need to think what the prior poster wrote about about is it possible to love someone more than chocolate? Really a difficult question. Love your blog and creativity. Let me know how it goes! thanks for the comment! This is a nice piece of craft you did for love. Every one loves to get hand made stuff on such special days, hope I may get something like this but I would be giving a machine made (to shop yet). Super cute and so easy. Pinning! What a super cute idea! Pinning this one!! Awe, those are so cute. I wonder of they have one for Swedish Fish? LOL I heart Swedish Fish and have to hide them from my kiddos. I would love to find one for those. This is so cute! What a great saying to go on a candy bar. Thank you for the free printable. I also love how you used foil. 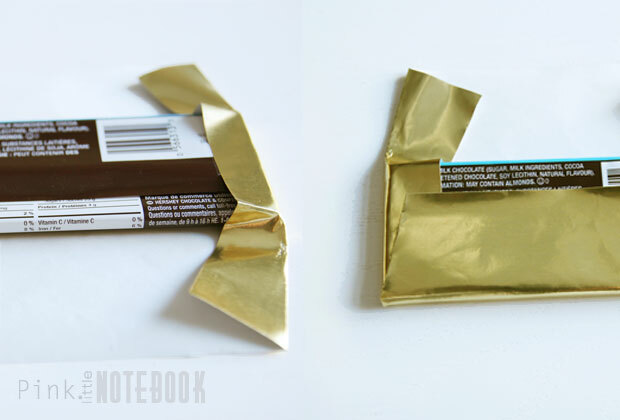 Not many chocolate bars (under $1) still have foil packaging – so its smart to add your own. That is cute. I don’t know if my husband , or anyone, would believe me if I gave that to them though. That is so cute and the step by step instructions make this a hard to mess up project. Thanks for sharing. Sometimes a quick and easy one is what you need – thanks for sharing! This is sweet and simple! Thanks! This is just perfection! Thank you for sharing it. I know just the perfect sweet man to do this for. Thanks SO much for linking up to last week’s Hit Me With Your Best Shot! Loved this valentine idea!